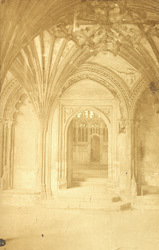 A doorway in the cloisters of Canterbury Cathedral leading to the site where Archbishop Thomas a Becket was murdered in the north west transept. The cathedral was founded in 597 by Saint Augustine and rebuilt in the Romanesque style by its Norman Archbishop Lanfranc. During the first half of the 12th century much was added to Lanfranc's monastery and the nave and cloisters were rebuilt in Perpendicular style in the 14th century by Prior Eastry and Prior Chillenden.